The second feature of Apple's new Maps is perhaps its weakest: transit information. This represents a significant change over how the previous iOS 5 Maps work, and is essentially dependent upon the availability of third party routing apps for the region you are in; these range from very good to nothing at all. With iOS 6 Maps, Apple has handled transit directions (which means anything other than driving or walking) the same way that it supports mobile data service on its Macs: it leaves everything up to third parties, leaving just enough hooks in place for someone else to do the job (whether or not somebody actually does it). Rather than taking on the huge task of adding a public transit layer to its new iOS 6 Maps app (which includes marking stops by operator, showing routes and finding interagency, multi-line directions with arrival and departure times), Apple simply delegated the task to third parties. While this may appear to be a huge cop out, it's also probably the best decision the company could have made to get iOS 6 Maps to market. As Apple's head of iOS engineering Scott Forstall announced in June, "When building Maps, we looked around and realized the best transit apps for metros, for hiking, for biking, are coming from our developers. And so instead of trying to develop those ourselves, we are going to integrate and feature and promote your apps for transit right within the Maps app in iOS 6." Apple essentially focused its resources on building a maps service oriented toward drivers and pedestrians, leaving the door open to its App Store developers to address the kinds of tasks they had already been performing as an alternative to Google's basic transit information and routing in iOS 5 Maps. 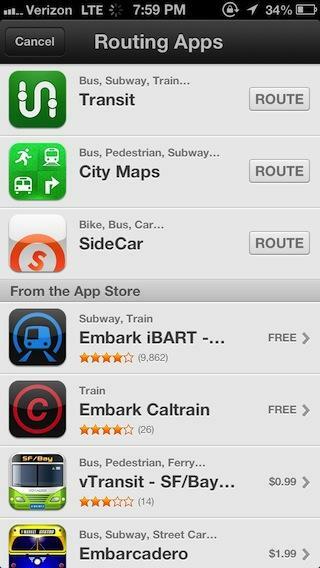 Had Apple taken on transit directions itself, the new Maps would likely still not be finished. Instead, Apple integrated support for third party transit apps by enabling users to find two end points within Maps and then forward them to a specialized app for routing (shown above). This not only makes it possible for third party app developers to deliver urban transit directions (such as metros and city busses), but also regional directions (trains, interurban busses and airplanes) and specialized direction routing (including hiking trails, bike directions, ferry connections, even other options like taxis and ride sharing). Less than a month after iOS 6 first shipped, the full potential of this integration hasn't yet been realized. There is, however, already a variety of good to exceptional apps that support this integration, including several new types of transpiration that iOS 5 Maps never offered, such as bike routes and ride shares. Even in areas where there aren't many (or any) routing apps shown for iOS 6, there likely are transit titles in the App Store, or information available via web apps, including Google's own. For example, HopStop provides Google Transit information in a free iOS 6 integrated app, with an improved interface, local transit maps, and other features. Apart from forwarding two endpoints to another app (and providing App Store integration to help you find relevant apps capable of finding routes between a particular set of end points), Apple hasn't even taken a stab at showing transit lines in the new iOS 6 Maps. There are just enough bus/metro/train/streetcar stop icons on Apple's new maps to make it clear that it expects you to jump to a dedicated transit app to find your way around via public transportation, rather than trying to plan transit trips within Maps itself.